Rocket Arena 2One stop for all things Ra2 related! Quake 2 Pro, an easy to use client to get you started with Quake 2 today! For all up to date information on games and tons of other community members. Click here to visit the forums and signup! Everything you need to get playing in minutes is available right here! First download is the Quake 2 Starter, which include the demo version of quake 2 (all you need to play online multiplayer) and the q2pro Client. It's super easy to use, and extremely customizable. The second download provided contains easy to see blue and red skins for rocket arena 2 and will even work in all other mods of the game. Simply download and install the Q2 starter. Once it's installed place the brightskins.pak (provided above) file into your baseq2 folder which can be located in the started install folder! **Also note if it does not work in ra2 upon joining the server, place it into the "arena" folder. Any questions? Please check out the contacts page. 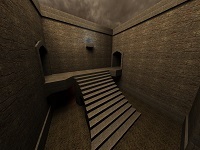 Rocket Arena 2 is a team based game in which each player spawns randomly around an arena styled map. Each player spawns with 100 health and 100 armour. Once the countdown finishes you are to use whichever weapon you want to eliminate the enemy team. The winning team gets awarded one point for each round won. Player scores are added up by every 100 damage you do. You should also note that any self explosions from a weapon will take off your armour but not your health, and fall damage is a thing, so watch your health before you leap!